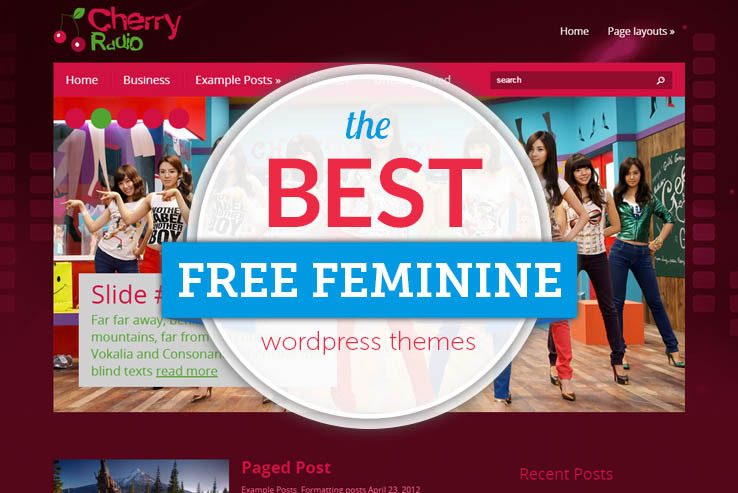 Are feminine WordPress themes only for women? Of course not. However, the femininity of your theme depends on the subject you plan on covering for your blog or the products you’re thinking about selling in your online store. Feminine themes are those that incorporate what could be considered stereotypes associated with femininity. They include lacy designs, flowers, pink and purple colors, elegant fonts, and plenty of places to upload photos and share content, too. Really, feminine themes offer the same functionality as any other theme, but they are generally used if you’re certain that the target demographic consists primarily of women. The subject matter of these sites is typically varied but can include fashion, health and wellness, beauty, spas and salons, gardening, cooking, and crafting. Will a Free Theme Work? Many of the best feminine themes require you to fork over some cash, but that’s not what we are looking at today. Let’s take a look at the best free feminine themes so you don’t have to spend any money and you get your site launched with minimal investment. Plus, you’ll be pleased to find out many of these themes include feature sets in line with the premium options. 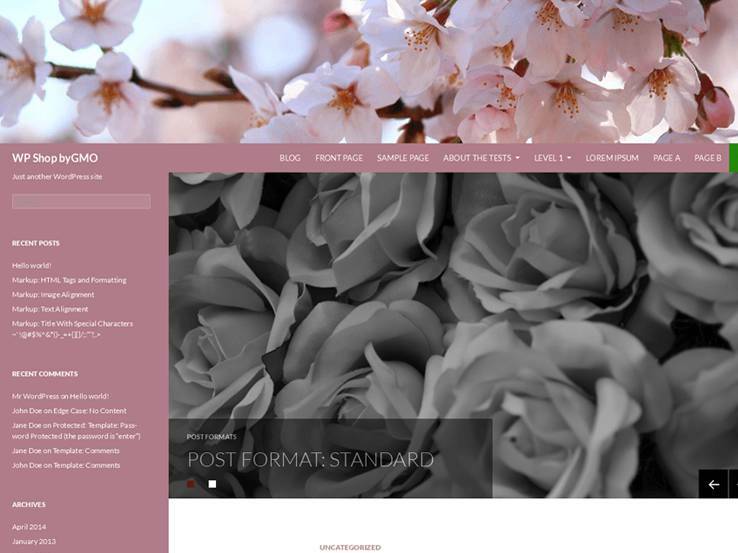 The Rose WordPress theme is as feminine as these themes get, with dark pink rose petals scattered throughout the header and the whole theme focused on the idea of flowers. The theme, just like everything else in this post, is free, and it comes with a share bar so you and other visitors can quickly share your content on social media. The Rose theme works with WooCommerce in case you want to start monetizing your site by selling products. This feminine theme works on every device and the custom widgets and shortcodes let you modify the theme to make it look perfect for your own brand. The It’s a Girl theme is designed particularly for baby girl blogs, but we can’t help but think that this design would work for various other purposes as well. The theme features a front-page center widget area that is perfect for displaying your high-resolution photos. The theme has design elements such as dresses and ladybugs that add a touch of cuteness, which makes this theme a great choice for mommy bloggers or any other type of blog whose target audience is women. The blog has two sidebars for fitting in multiple widgets, and the blog posts are displayed in a list format with dates looking like hearts. Milady has a feminine design that it doesn’t go over the top. The colors are somewhat muted and the header features a gorgeous slider as well as the standard navigation bar, which make the theme feel similar to any regular small business website. The custom widgets are perfect for featuring items like videos, photos, and recent posts. Some other features include a social share bar, WooCommerce support, and plenty of shortcodes. This is a quality theme for a business or blog that doesn’t want to put much work into the design. 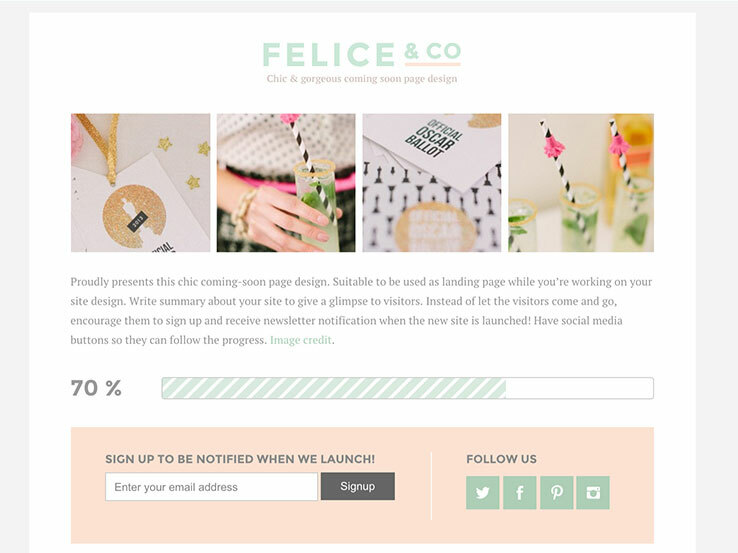 Felice is our favorite theme on this list because of its elegance. You don’t have to look very far to realize that this is a design that looks premium but comes free. The minimalist design lets you showcase a stylish logo in the center of the homepage, and the theme even comes with a wonderful-looking email signup form to gain more followers. The responsive layout works well on just about every browser and it even comes prepackaged with a progress bar to let people know how long it’s going to take for you to finish building your website. The Girls theme is a bold and vibrant feminine theme that would be a perfect fit for a teenage girl who wants to start her own blog. 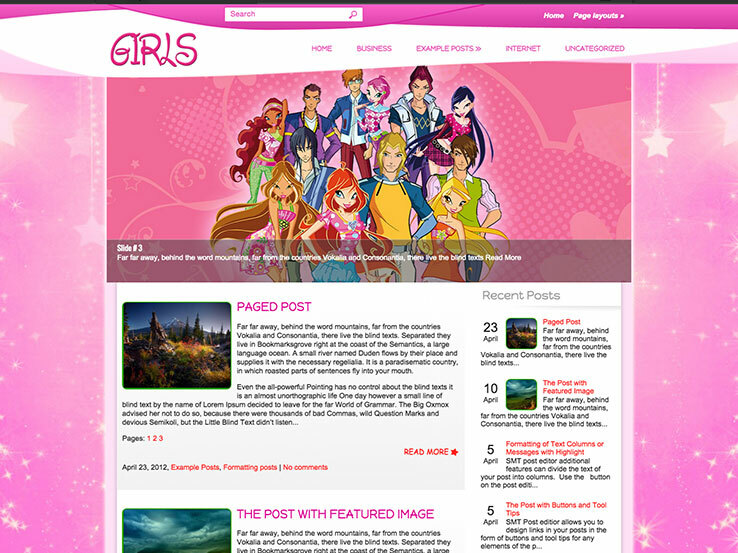 The theme features bright pink colors and font swoops. The theme is responsive and the slider is wonderful for showcasing your favorite images on the homepage. The custom sidebars are perfect for adding extra content to your sidebars and you can display your latest blog posts and recent comments, add a video, and more. The theme also comes packaged with SEO customization, shortcodes, a contact page, and several page layouts. The Scrappy theme is a simple theme that’s perfect for those who want a place to post their thoughts and focus on running an online journal. 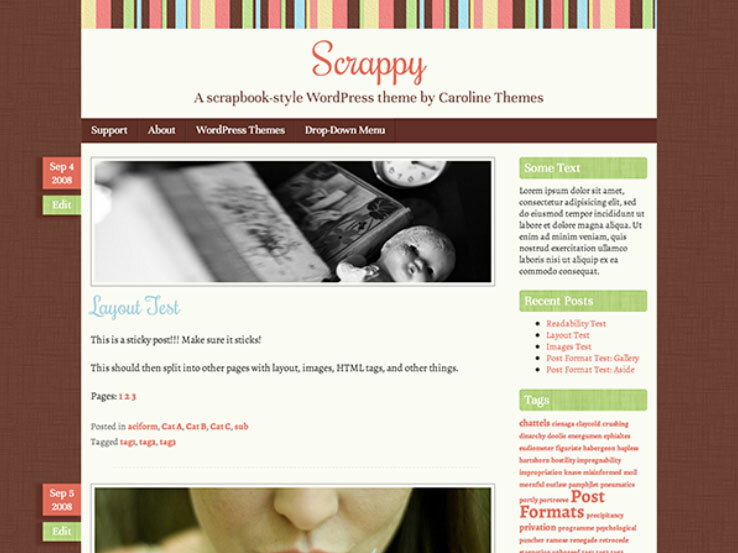 The Scrappy theme is designed to look similar to a scrapbook, so you can place all your images, text, and whatever else you want in there. The minimalist theme has a few customization options allowing you to change the color scheme and upload your own custom background. The brown and pink color scheme is pleasant on the eyes so it can even be used by those who aren’t focused on serving a female audience. 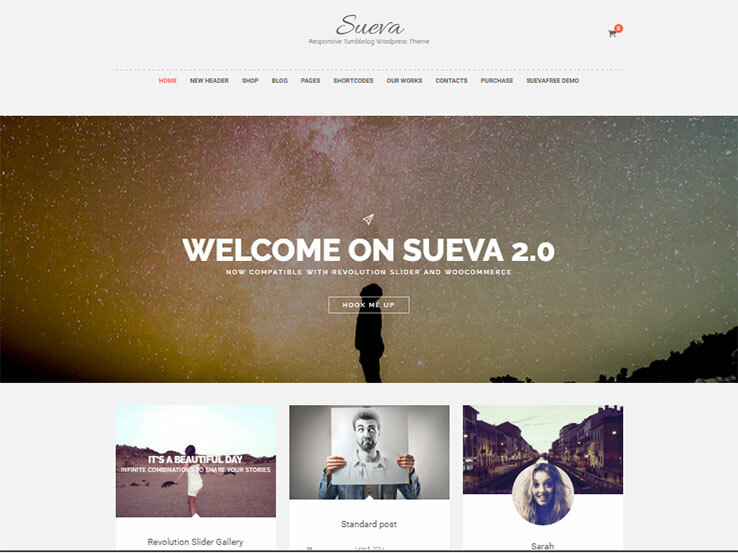 With browser support, post formats, and a handy options panel, the Sueva WordPress theme gives you all the functionality you require from a feminine theme. 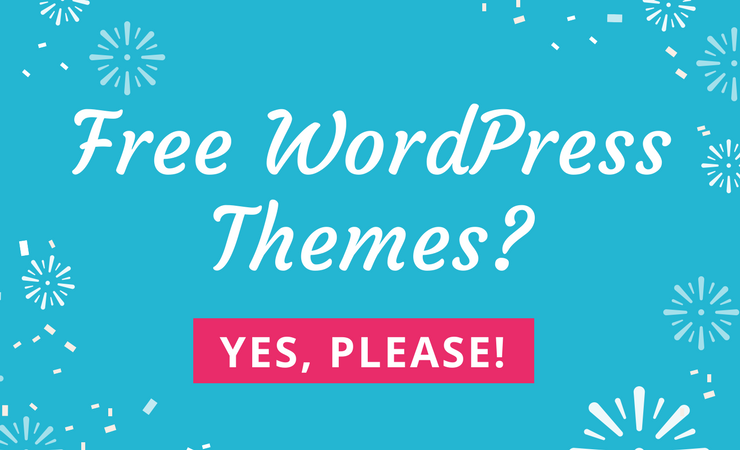 The theme also has a premium version with more functionality, but if you’re just getting started with blogging, the free theme is more than enough. Sueva has a neutral color scheme with elegant typography and the homepage is set up similarly to a Pinterest layout. 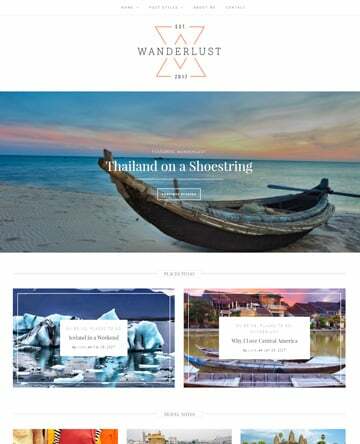 This theme works flawlessly on any screen size, and thanks to the beautiful slider and featured images, it’s a great choice for anyone who needs to use a lot of imagery in their content. 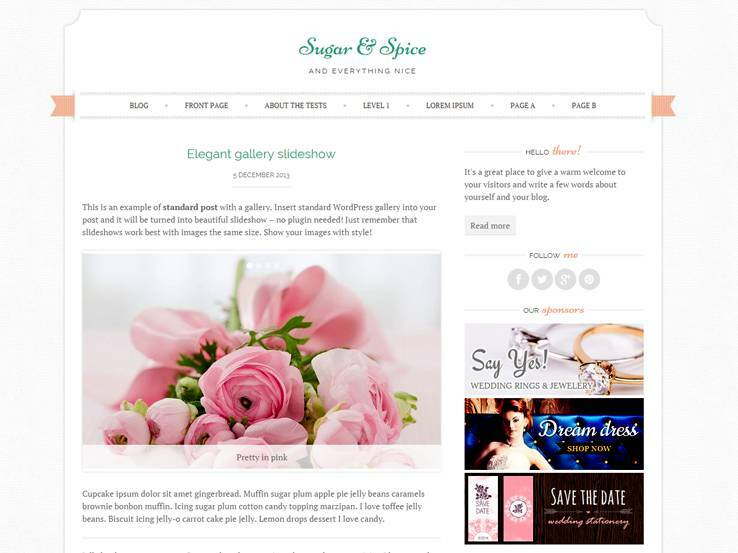 Sugar and Spice theme is another one of those free themes that looks premium. The sleek and elegant theme provides plenty of white space to bring attention to your content. The menu looks simple and elegant, and you can upload your own logo. The Sugar and Spice theme was created with the wedding industry in mind, but that doesn’t mean you have to stick with that. This gem works nicely for small businesses and blogs with focuses on female products, family, travel, and more. This theme truly works like a premium website since you can upload your own favicon, change the colors and backgrounds, and even choose from three different layouts. Not to mention, the theme is completely responsive. 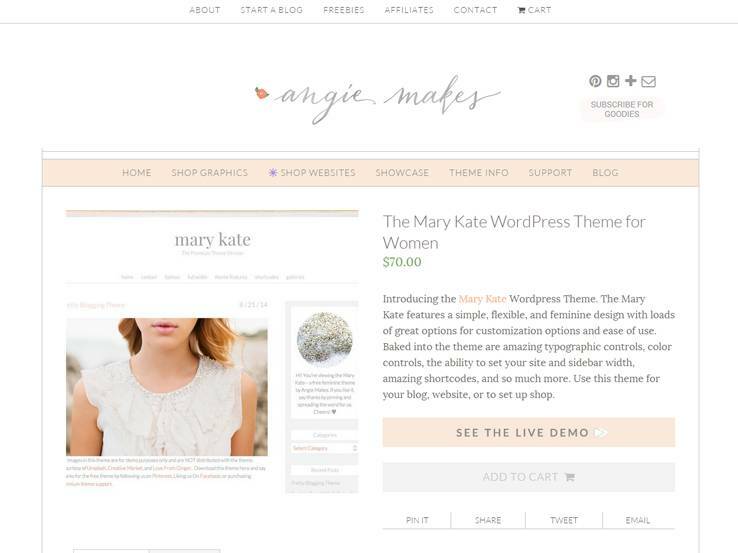 The Mary Kate theme delivers a simple yet elegant feminine design. This theme is designed for the businesswoman or blogger who truly needs a way to showcase her content without any distractions. The homepage includes lightly tinted shades of pink and blue and the custom buttons and widgets are on par with some of the better premium themes on the market. Our favorite part is that the theme integrates directly with the Pinterest RSS so you can pull in new items from your feeds and even Pin components straight from your website. Choose from full width or sidebar page templates and upload your own custom fonts if you really want to take your branding to the next level. 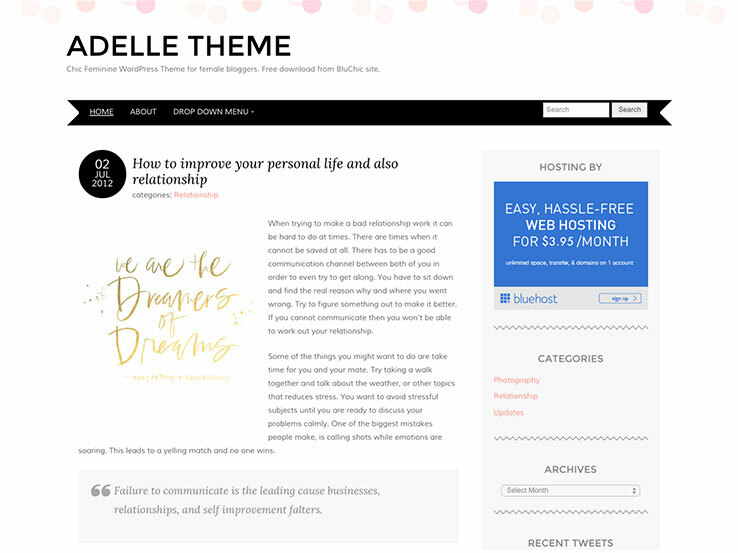 The Adelle theme is a stylish and elegant theme that adds a touch of personality to your blog design with the fun confetti header and circular dates. You can upload your own logo and add various widgets to your sidebar to add more content to your pages. On top of that, it’s responsive so it will look good even on mobile devices. We can see this theme being used for just about any type of company that’s run by a woman. We can’t guarantee that this theme is ready for a large amount of functionality, but if you need to get your content up online, this is a convenient way to do it. The Clippy theme has a similar look to Pinterest and it integrates with the social media platform as well. The default fonts are fun and shaded pink, but you can always change these if they are too feminine for you. 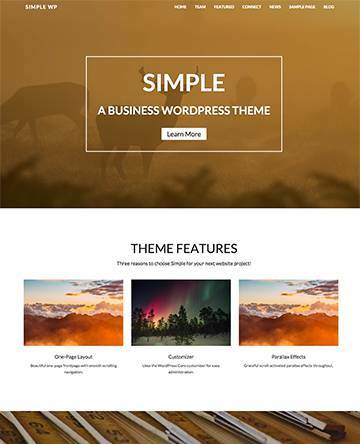 The simple and responsive theme is a great platform for sharing content quickly and you can create a welcoming interface that allows people see your posts and featured images. The images show up nicely and you can even see previews to each article without clicking on them. Thanks to this layout, you can easily create a magazine-style website. 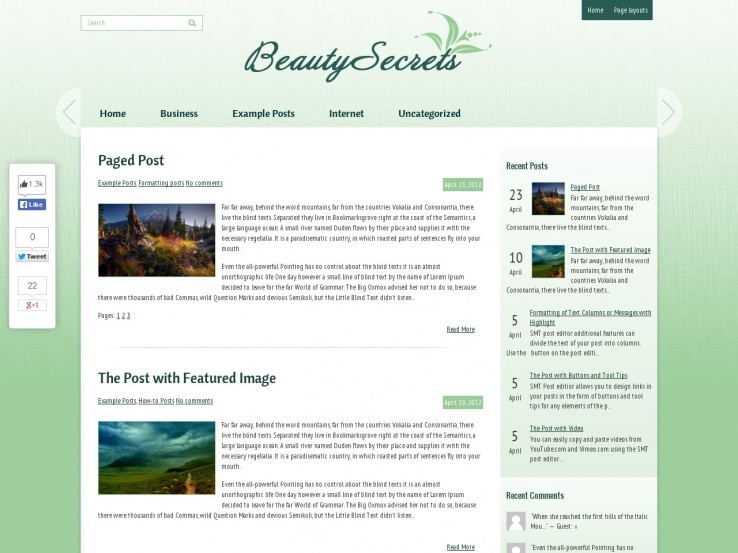 The Beauty Secrets theme delivers an extremely light interface with charming components and green colors for anything from a gardening blog to an herbal supplements company. The idea behind the theme is to help female bloggers or companies that have a focus on nature. WooCommerce is supported in case you want to start selling products through the website and the Google Maps shortcode is wonderful for directing people to your location. The responsive web design works well on all devices and the social share bar is helpful in allowing readers to share your best content on Facebook and Twitter. An interesting feature is the multicolored related posts, which adds extra visual appeal to individual posts. 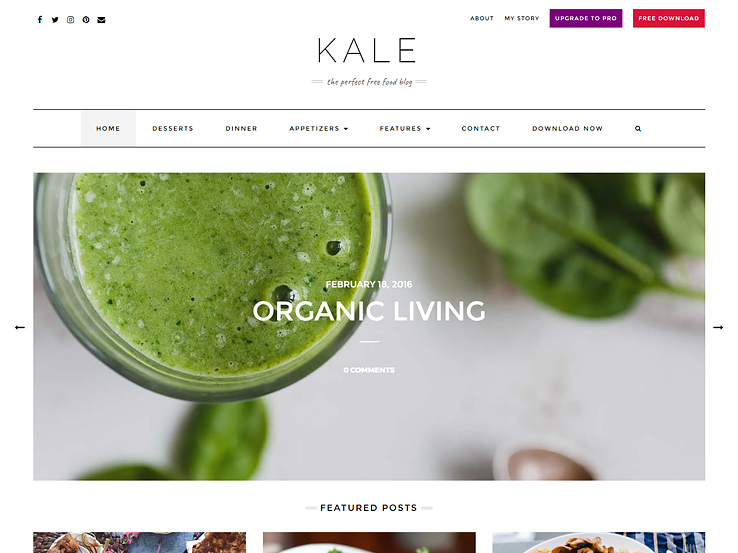 Kale is a free minimalist feminine theme that will not disappoint when it comes to elegance and style. 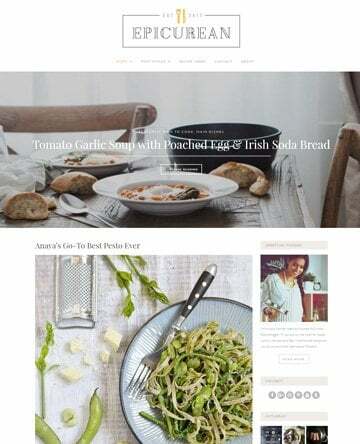 Designed with women foodies in mind that want to blog about their tastiest treats, this feminine theme is also the perfect platform for lifestyle, personal, and recipe blogs. Share large and colorful featured images, utilize the beautiful font types, and customize your background colors to give off the girly vibe you are looking for. Enjoy responsive and mobile friendly design so your readers on the go can enjoy your content and even upload a custom background image for a pop of color or added visual appeal. Last but not least, rest assured that you can install plenty of additional WordPress plugins for added functionality and never worry about conflicts. In addition, with Kale, you can create an eye-catching slider or banner, so readers know exactly what to expect from your site from the get-go. Upload a custom logo with a tagline for promoting your brand or personality, integrate social share icons, and even take advantage of the multiple available sidebars for getting your opinion across in a bold and exciting way, while remaining soft and feminine as well. In the end, build a solid navigation menu so site visitors can view your site with ease, add a simple search bar near the bottom to encourage further site exploration, and keep things light by utilizing the perfect amount of whitespace needed for your website to appear delicate and feminine. The Spring theme is great for those who have personal blogs. 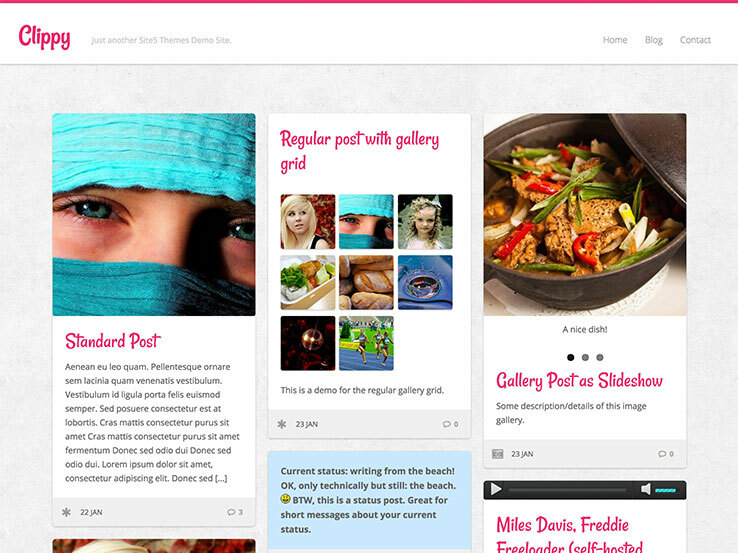 The theme helps you design a one-page website that lets you include all the content on your homepage. This is nice for putting all the focus on your written content and guiding visitors through a specific sales funnel. The colors and icons are creative and the theme also has a parallax background. Showcase your past work with a filterable portfolio and let potential clients quickly find the type of work they are interested in. There’s also a module to feature the people on your team, with informational details and buttons to their social media accounts. Finally, contact info and Google Maps are integrated into the theme, which makes it easy for your visitors to find the location of your business. 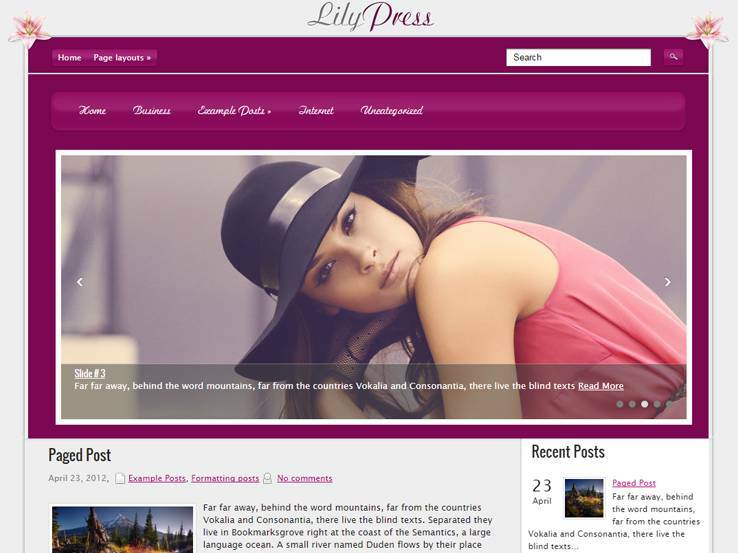 The LilyPress theme provides a stylish purple header area where you can include a slider and overlay a call to action on top of it. The theme integrates with WooCommerce in case you want to start selling products through your website and the custom sidebars allow you to easily place widgets throughout your site. The responsive design is always helpful for people to view the website on mobile devices. Use shortcodes to keep your hands free of any messy source code and try out the custom widgets to organize your homepage or your sidebars. You can also translate the website into a different language to connect with a wider audience. 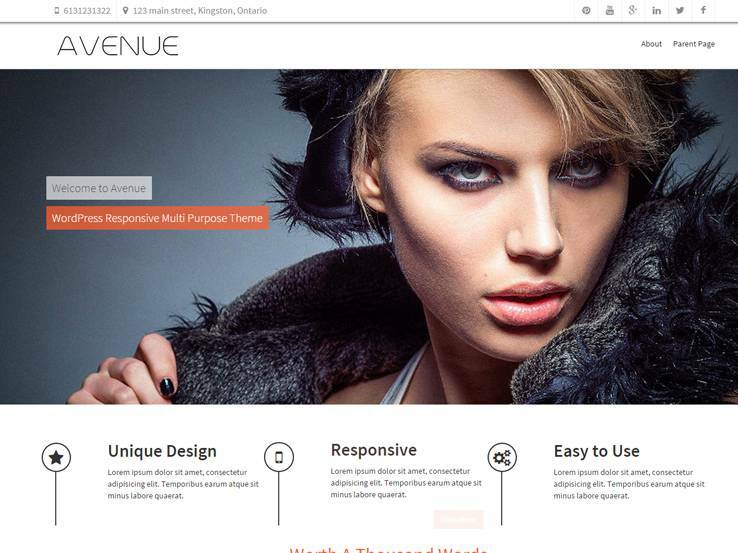 If you want a professional look with feminine touches, Avenue is a wonderful theme to start with. The multi-purpose theme is completely responsive and useful for businesses and individuals alike. The goal with the theme is to use call out boxes and widgets to showcase your products and increase your conversion rate. The sticky navigation bar makes navigation easily accessible and over 600 icons allow you to highlight specific sections of your website and add extra visual appeal. Choose between the three color skins and check out the six widget placeholders to place various widgets. The full-width banner is another standout feature since it allows high-resolution images for the ultimate advertising. The Bouquet WordPress theme is yet another free and feminine-styled theme, with purple and pink color combinations and a beautiful header area that allows you to upload your own header image. The elegant and simple theme is inspired by flowers since it provides two floral schemes and a powerful responsive format that ensures your website looks great on mobile devices. The theme is quite simple, but you can modify the header and background with any custom image you desire. The blogroll is the primary focus, which makes it ideal for bloggers who primarily write articles. Queen is the free edition of the premium theme that was designed to make a great business or blog just for women. It looks both vivid and elegant with its pink color palette and has multicolored related posts. It includes anti-spam protection without the need for Captcha. There are editorial options that let you custom design the look of your posts. It has a dynamic content loader that loads new content without having to reload the page and includes a social bar so your readers can share your content with their own social networks. Queen has custom sidebar layouts so you can have a page with or without sidebars. It’s built on the SMT Framework, which lets you customize and modify your site easily. It’s multilingual so visitors can read your site in their own language, and it’s responsive to look great on any screen or device and includes shortcodes for Google Maps. It also supports several content types to help your content stand out. It’s SEO optimized to help you rank higher in search engine results, making this theme a good choice for virtually any type of site. 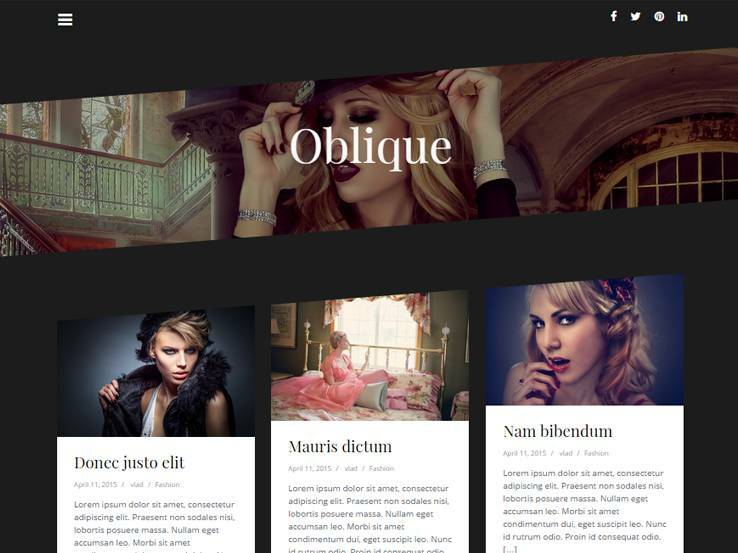 Oblique is a masonry theme with an interesting design with unique angles that look great for fashion websites and blogs. It has lots of features that would make any site or blog shine. It includes a parallax header image and a menu system that hides away and appears on command. Clicking the menu button brings the menu out as a vertical menu on the left of the screen. Clicking it again makes it slide back out of the way, giving you more space on the screen for your content. You can use your own custom menus, and there’s also a social menu that places social media icons on the right side above the header so your visitors will always see them. Using the customizer, you can modify all colors and fonts. This gives you unlimited colors and any Google Font you want. You can upload your own logo and set the logo size and padding. You can adjust your blog options to adjust the display of the number of comments and the post date. It does have credits in the footer that you can remove if you want to buy the extension. It’s responsive so it works well with mobile devices. This is a good theme for fashion blogs. 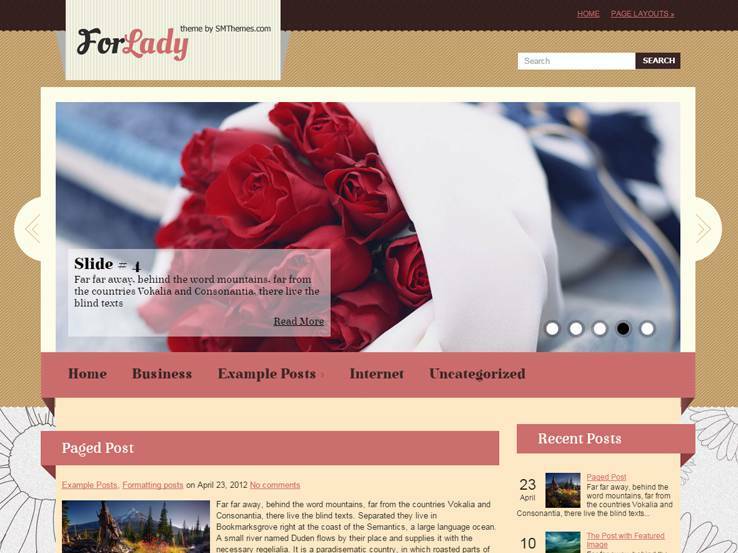 As with many free WordPress themes, the Forlady theme provides several stock images with things like flowers and women. 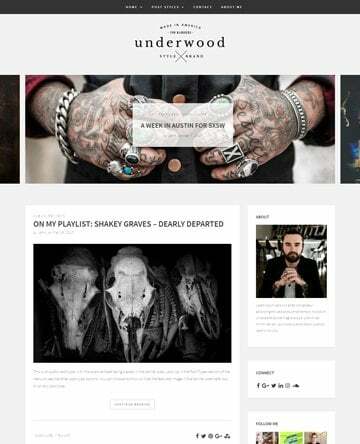 This theme is a great choice for simple blogs that want a feed on the homepage. It also offers a cool header at the top, supporting high-resolution images to display your latest posts or to provide a brief introduction about your blog. The logo is easy to swap out and the header also includes a search bar. The background has elegant floral elements. It also provides some pink and light red shades to round out the more female-based design. Page layouts are plentiful and various widgets allow you to easily place a list of your recent posts or comments, add a profile widget or display a social media feed anywhere on your website. WooCommerce is integrated with the Forlady WordPress theme so if you’re looking to sell digital or physical goods, it’s easy to turn your website into an online store. WooCommerce allows you to easily add products and set up payment options. The theme is completely responsive as well, which is nice for viewing on mobile devices. The custom sidebars work well and the Google Maps shortcode ensures that users know where to find you. In fact, dozens of other shortcodes are included with the theme, allowing you to add various design elements without touching any code. Along with a contact page and various social media buttons, Forlady is a viable choice for anyone who needs a more feminine-looking website. The Allure theme is primarily built for fashion blogs, but it works nicely for other endeavors as well. 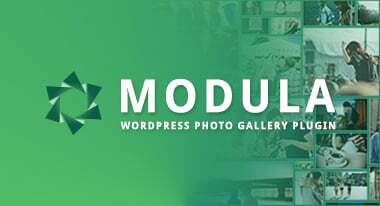 The theme is completely focused on putting the images at the front and center, with a beautiful grid-based format that creates somewhat of a portfolio look. The header image takes up the majority of the screen and you can implement text and buttons to serve as calls to action. This feminine-looking theme looks somewhat complex, yet it’s actually one of the simpler solutions. The homepage consists of images that link to your most recent blog posts, making it perfect for visually oriented blogs and magazines. A search bar makes it easy to find the relevant content. The advanced features aren’t too overwhelming so you can focus on getting your content out as soon as possible without spending too much on the customization. The Allure WordPress theme is a completely responsive theme, which means it will look great even on mobile devices. The great thing is that you can expand the functionality of this theme however you want. It just takes a simple WordPress plugin to do so. If you need support for images without excess features, Allure is a great choice. This is a truly minimalist solution, so try it out if you want to put most of the focus on your content. 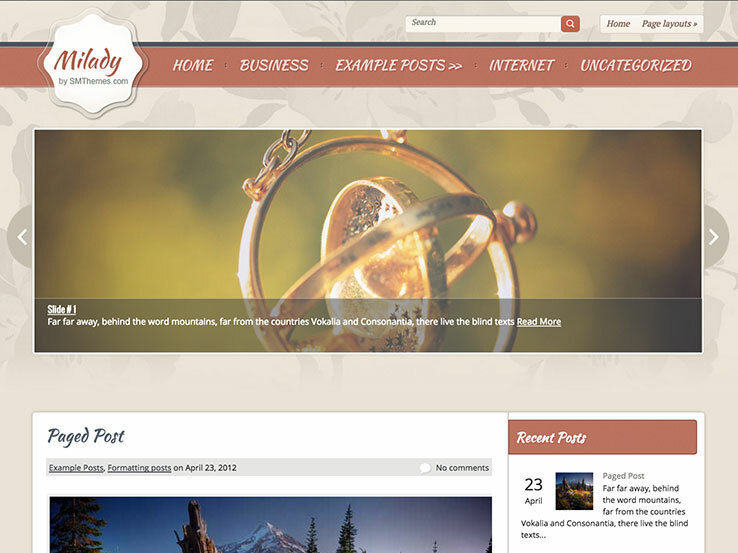 Madeini is a child theme of the TwentyFourteen theme, which means it essentially comes with all the features found in TwentyFourteen. This also means you are free to customize the theme however you’d like without the fear of losing your changes when an update is released. In terms of features, the design has been adjusted to appeal to a more feminine audience with a dark pink and green color scheme. It would be a great theme for a photography-oriented website or even food and travel bloggers who like to share lots of images on their site. 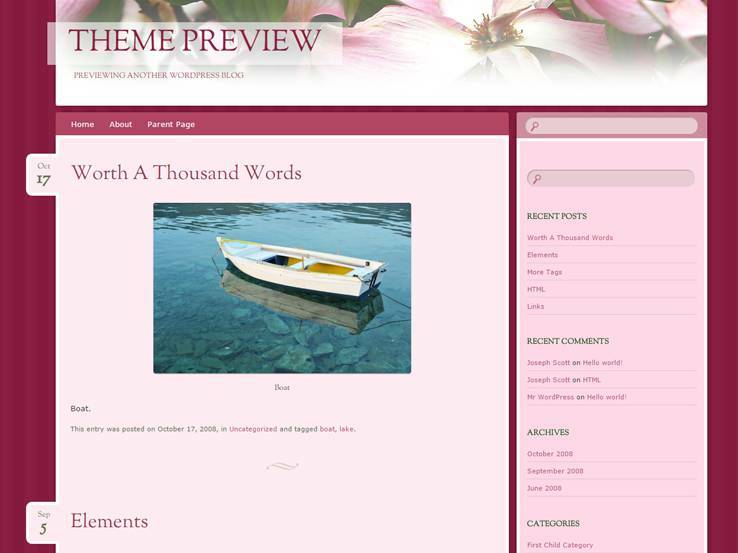 The theme includes a customizable header and you can easily adjust the pink color to better match your brand. A nice slider is also included to feature your latest posts, while individual posts have big featured images that are sure to pull your readers in. A sidebar occupies the left-hand side of the screen and you can use it to add various widgets such as a list of your recent posts or your social media icons for connecting with your followers on social media. The theme is also fully responsive and looks great on mobile devices as well as on desktops and laptops. 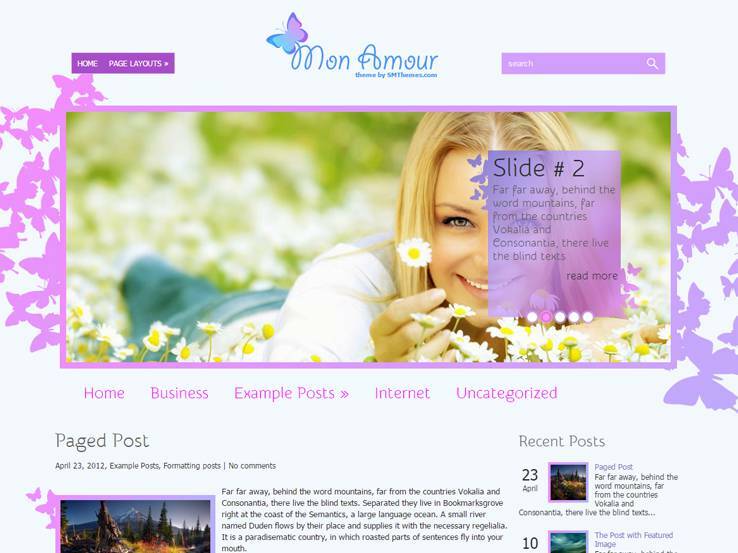 The MonAmour WordPress theme provides an elegant and colorful take on the feminine theme with fun butterfly backgrounds. WooCommerce integrates with the theme, which is perfect for those feminine bloggers out there who also want to sell items on the site. The dynamic content loader is a bonus, and you get a Google Maps shortcode for showing people where your brick-and-mortar location is. The MonAmour theme is completely responsive and looks great even on mobile devices. Several shortcodes are included with the theme, making it easier to add items like columns and buttons. We particularly like the social sharing bar that means your visitors can easily share your content. A contact page is an easy way to keep in touch with your users and it means that you don’t have to go out and find a third party plugin for this functionality. One thing to keep in mind is that translation files are provided so you can easily translate your website. A solid slider gives you the opportunity to display information about events, promotions, and products, while the anti-spam Captcha protects your site from spammers and hackers. Related posts are displayed towards the bottom of each WordPress blog post, which comes in handy for keeping people on your site for a longer period of time. Overall, it’s a beautiful theme, and you can’t go wrong with the free price tag. 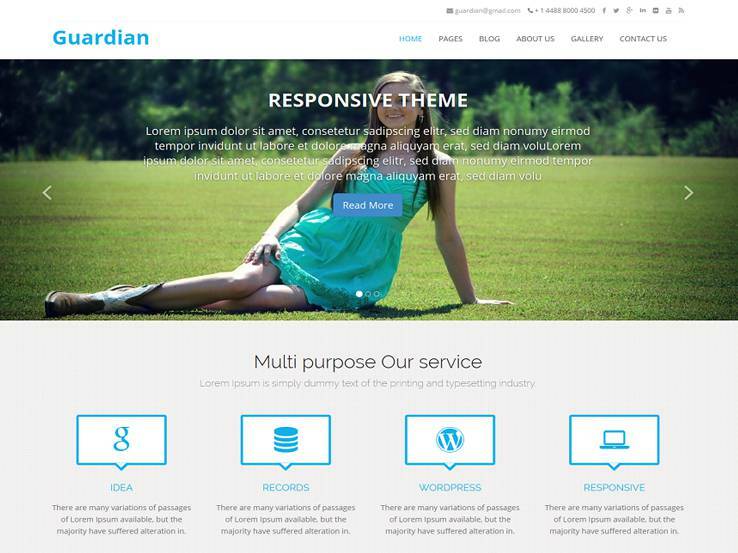 Consider the Guardian theme if you’re looking for a feminine theme that’s more business-oriented. The theme starts off with the ability to show your contact information right at the top, followed by a full screen slider which is a perfect place to promote your services, products or other important pages on your website, along with a text overlay and a call-to-action button. Showcase your services in a 4-column layout below and use the blog section to promote your latest posts. This shows your readers that you are willing to share valuable insight with them and it boosts your search engine rankings as well. The theme has several page layouts that offer some variety for your website and four page templates that facilitate the design process. 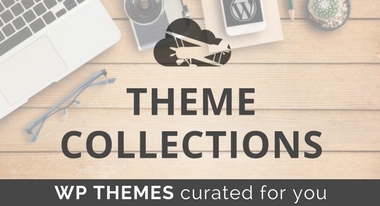 The powerful theme options page has all the settings necessary to integrate your brand with your website and you can even integrate your theme with WooCommerce to sell both digital and physical products straight from your website. 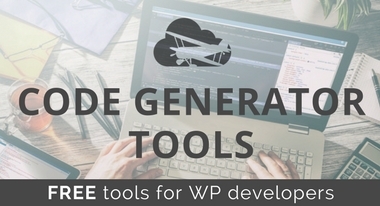 The theme is also compatible with WPML plugin so you can easily create a multilingual website and collaborate from clients worldwide. On top of that, Guardian is fully responsive for the ultimate compatibility with mobile devices. 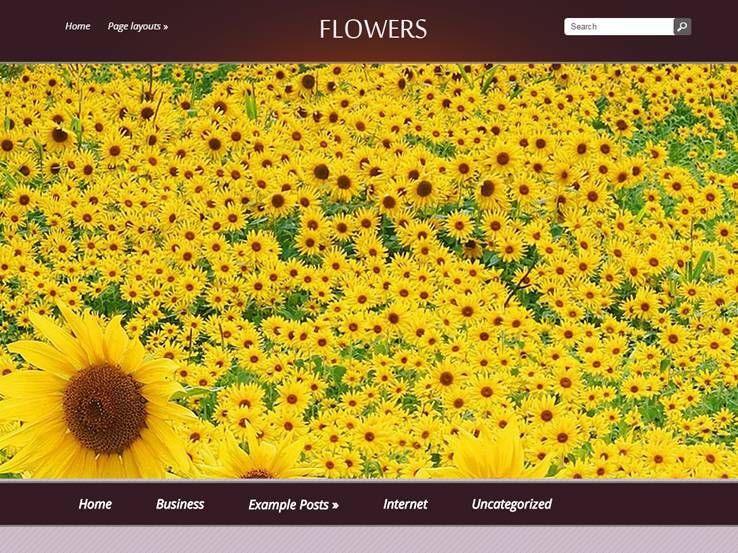 Flowers is a rather delicate theme suitable for personal bloggers who simply want their own space to share their thoughts with the rest of the world. The theme includes a two-column layout with a customizable header and a dynamic content loader which basically allows you to load all of your content on a single page without overwhelming your users. Custom sidebars are also possible and all of the posts have the ability to add a featured image to add more visual appeal to your website. A social share bar is also included so your readers can share your content on various social media networks. The theme is built on top of the SMT Framework, which allows you to customize every aspect of the theme, and you can translate your website easily to connect with readers who speak a different language. The theme is fully responsive and includes SEO optimized code, which is sure to give your website a boost in search engine rankings. Several shortcodes are also available to add elements like buttons, lists, toggles, and more. 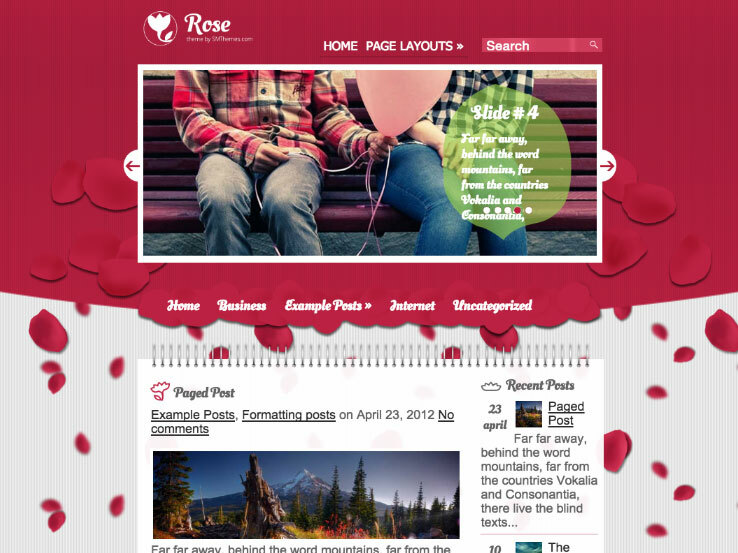 Overall, the Flowers theme offers simplicity so give it a try if you want to build a personal blog. 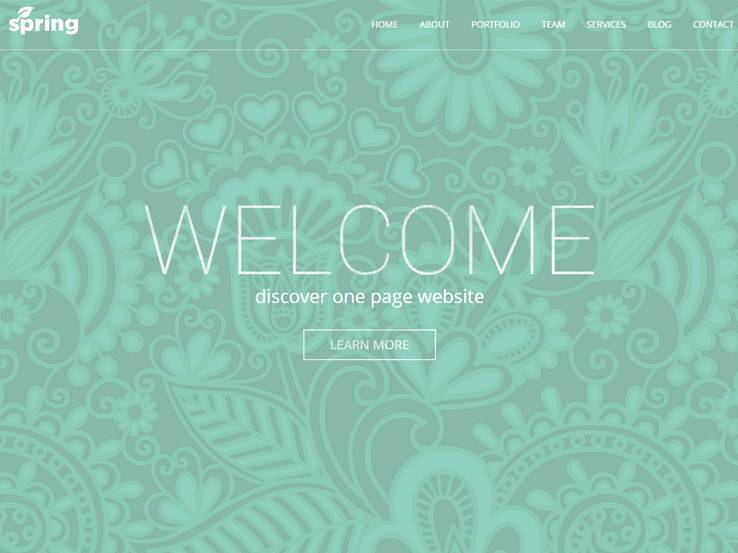 The next time you start looking around for womanly themes, start your search by testing out some of these free feminine website templates since a few of them are rather powerful, and you can customize some of the options to your heart’s content. Share your thoughts in the comments section if you have any questions about the themes we just discussed or if you have any other feminine themes that should go on this list. We will keep Enamored in mind for the next update. It is a beautiful theme! A Woocommerce WP theme that is suitable for florist, flower shop, accessories store or jewelry shop. And i think it’s useful to refer. Thanks for suggesting Amour to our readers. The wishlist feature is a unique addition to this theme. Happy to help, did you find a theme that will work for you?